We arrived at the main gate to the Cape of Good Hope National Park at what used to be a kiosk and is now a grand entry point into the park. Its built of stone that must have been collected in the area. Cape Point is well known for its wind and today was no exception. The south easter was howling in from the Indian Ocean and blowing everything before it. The climate in the park is very harsh with the strong winds and the salt that it brings in from the sea. The bush is hardy and well adapted to the climate. In the park there are a number of roads that give one access to the sea. The most northerly access road is the drive down to Oliphantsbosch. (Elephant's Bush) From the carpark there is a short walk down the coast to the wreck of the Thomas Tucker which ran aground in the park during the war years when its compass failed. There are bits and pieces of it strewn around and one has to mind ones feet if you don't want to injure them. The sea along this coastline is cold and has the most beautiful turquoise colour. Divers love this stretch of coastline as there are many types of fish, crayfish, and abelone to be found amongst the rocks and kelp just off the beach. 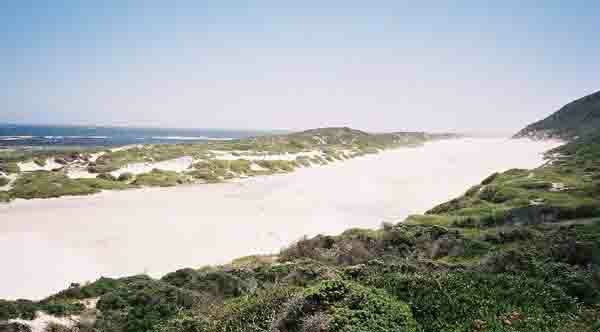 Bordjiesdrift is at the end of the next access road to the sea on the eastern or false bay side of the park. It has a lovely little kelp filled bay which looks good for diving and fishing. Nobody was in the water as the wind was so strong. Even the seagulls had parked themselves line abreast in the parking area facing into the wind so as not to be blown away. Bordjiesdrift is where Vasco da Gama landed and planted his cross in 1487. A replica of the cross still stands proudly on the hillside just above the bay. 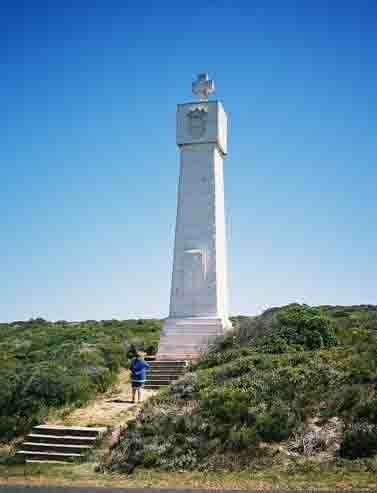 From the cross there is a good view of the old lighthouse at the top of the Cape Point Hill. A short distance from the da Gama cross is Buffels bay. It has been developed and has lovely lawns and facilities for picnicing and having a braai. (barbecue) It's reasonably sheltered from the wind so one can actually make a fire without it getting out of control. Driving towards Cape Point we criss cross the park to visit all the sights using the various access roads which lead off the main road. On the right we can spot the other Portuguese cross erected in the park by Bartholomew Diaz. It stands as a shipping beacon these days and can be seen from False bay and the Atlantic ocean. The next road to the right takes us back to the Atlantic Ocean and to a beach called Platboom (Flat bottom). There's a lovely sandy beach and to the north is a range of dunes close to the sea.The sea in this area is normally an exquisite colour of blue and visitors make an effort to stop here for a photograph or two. 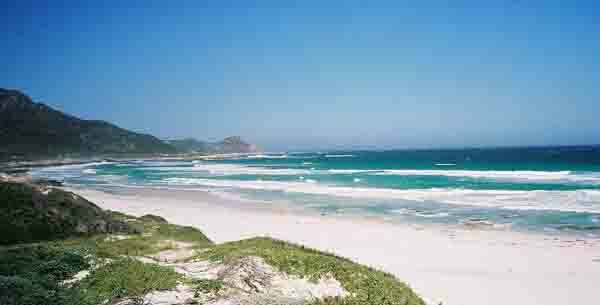 This beach is also well used by windsurfers as the wind and waves are perfect for surfing. Following this road to its end we eventually arive at the Cape of Good Hope, the most south western point of Africa where on a windy day the wind is so strong that it is almost impossible to stand. At the signboard there is normally a scrum of people all trying to get their photos taken at this point of Africa. This stretch of road normally provides visitors to the park with some wildlife as well. One comes across the baboons from time to time, a bevy of long legged ostriches amd sometimes a bontebok or two. 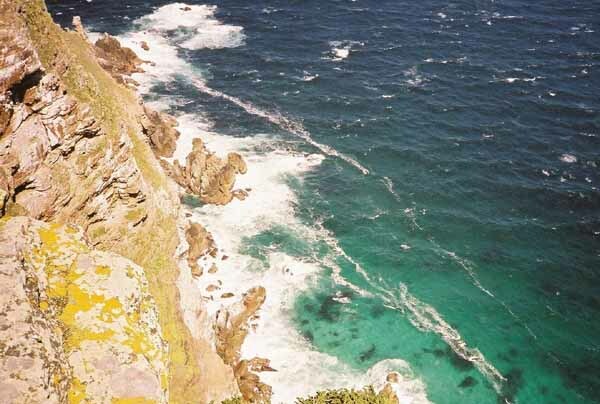 Further south is a turnoff to Rooikrans (Red Cliffs) on the False Bay coastline where fishermen take their lives into their hands as they fish into the deep channel that runs along the base of the cliffs. Here they catch yellowtail on spinners and when the fish are on the bite there is much fun to be had as the fishermen vie for spots on the cliffs. We eventually arrive at our destination which is Cape Point. The parking area at the base of the Cape Point Hill is full of visitors from all parts of the world and in amongst them were some of our old friends the baboons. They have been there forever and unfortunately have developed some bad habits. They are attracted by food and will attack you to take away anything that looks like food. They get quite aggressive if you won't let go of what you are carrying and even bite if they have to. A scary experience if you don't know what to do when one of them approaches you. As protection for visitors some of the rangers walk about with catapults which they use to chase the baboons. This however is pretty ineffectual as they cannot use them when there are crowds of people and cars in the parking lot. The baboons even while being chased by the rangers will grab food from unsuspecting people and then make off into the bush to eat what they have taken. Once they have eaten they will be back for more and some other unsuspecting person will lose their lunch or snacks. 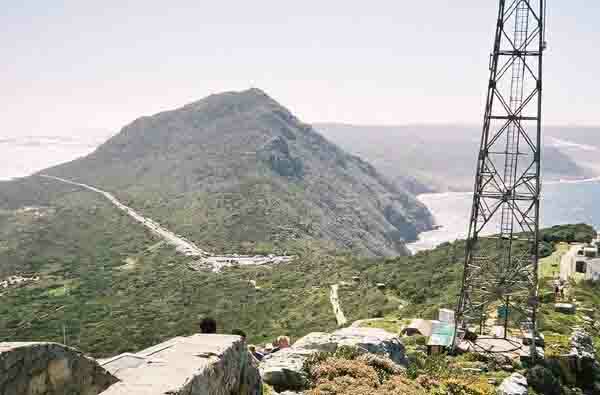 The point of the visit to Cape Point is to climb to the top of the hill to look back at the Cape Peninsula and the views out over the Atlantic ocean and False Bay. From the carpark there are two ways to get to the top of the hill. The funicular or a strenuous climb. For those who have travelled from all parts of the world you cannot turn around in the carpark, you have an obligation to go to the top. Why the obligation you may ask? 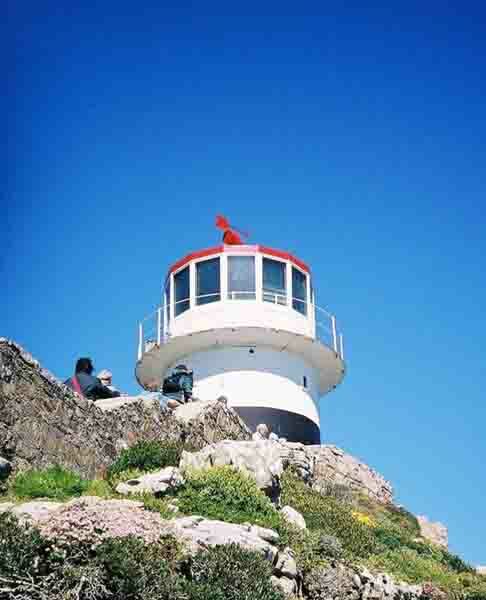 At the top there is a replica of the old lighthouse on the spot of the original Cape Point light. The view from the lighthouse over the cliffs to where the two oceans (Atlantic and Indian ) meet is quite spectacular. The old lighthouse is about 300 metres above the sea and one can look down over the protective wall onto the sea and waves far below. If the wind is blowing you should see many sea birds gliding in the thermals rising up the cliff face towards you. From the old lighthouse you cannot see the new lighthouse but can look out over False Bay and see the Hottentots Holland mountains to the east. To the south west of your vantage point about a kilometre off the beach there is a spot of really rough sea. This is Bellows Rock which was the place where the Lusitania ran aground so many years ago. Mariners out to sea are warned of the rock by a redlight that shines from the lighthouse at night.Many lookout points have been built along the cliff faces over the years and from them one is able to get a glimpse of the new lighthouse on the rocks about a 30 metres above the sea. There is a pathway on the False Bay side of the point that leads down to the lighthouse. I am not sure whether this is open to tourists but I do know that it runs along the cliff face and has a number of very steep staircases one has to climb up and down to reach the lighthouse. The lighthouse itself is very unspectacular and for my money is not worth the effort of climbing down to see it.The view from the cliff faces is much better in my opinion. From inside the restaurant and from the promenade decks around it you are able to get some spectacular views over False Bay. 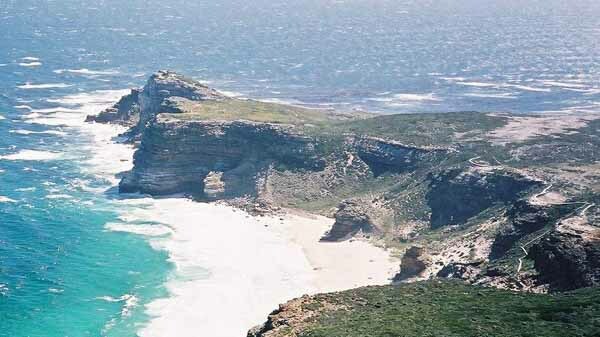 A visit to Cape Point one of the top tourist attractions in Cape Town is a must and should not be missed.